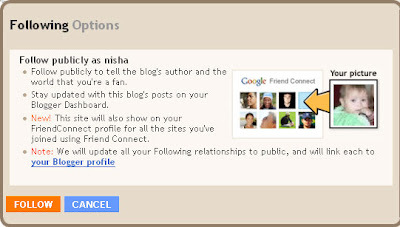 Today, i finally got time to change the 'anonymously' being shown, to 'publicly' being shown settings of my friend connect so that i'll be able to be viewed as ‘Nisha’, and not like an invading alien.. hehe, so if you noticed friends, am there now as nisha, and my display picture is of a baby in green which is actually my little Baby of two years, Alisha. Ahh!.. You all know her :).. The thing is that google has solved an issue i was confused about and it hepled save so much time. When i logged into my dashboard to change the settings i was excited to spy upon a link which i read as something like ‘do you want be a follower on your friend connect widgets publicly? and I was like... oh, thank god! I clicked on that and got what you are viewing in the image below! Hehe... luckly i didn’t have to go about them one by one as i've written about how Following a blog with google connect allows more exposure to your sites.. The beneficial fact about this widget is that your friends now can now have access to all the social networking sites your a member of, including orkut!! and you get to choose which of them can.. change then all in one go, if you haven't yet!